Shahan, John M. and Alexander Waugh. Shakespeare Beyond Doubt? : Exposing an Industry in Denial. Tamarac: Llumina Press, 2013. By way of contrast to Shakespeare Beyond Doubt, Shakespeare Beyond Doubt? (note the clever question mark that is part of its title) offers nothing new, substantive, or interesting. It trots out the same old conspiracy theory verbiage that has been debunked and debunked and debunked like a platoon of the Marine Corps hearing reveille for the thousandth time. The image above provides a side-by-side comparison of the two volumes. While larger in size than Shakespeare Beyond Doubt, Shakespeare Beyond Doubt? evidently failed to get the rights to use an image from Shakespeare in Love (or even Anonymous, which might be a logical second choice) for its cover. Shakespeare Beyond Doubt was published by Cambridge University Press, an immensely reputable press; Shakespeare Beyond Doubt? was published by Llumina Press—well, really, it was self-published: Llumina Press is a vanity press rather than a press with an editorial board and a peer review system. But that's all, so to speak, judging two books by their covers. The contents are the more important part. Here we find that Shakespeare Beyond Doubt has listened to authors like the authors of Shakespeare Beyond Doubt? and carefully, thoughtfully, and meticulously dealt with their misapprehensions. The authors of Shakespeare Beyond Doubt? (which was published after Shakespeare Beyond Doubt) seem not to have read Shakespeare Beyond Doubt. They do not respond to the careful argumentation of Shakespeare Beyond Doubt; instead, they return to their misapprehensions and misrepresentations and merely reiterate them. Like much conspiracy theory argument, this might be technically true up to a point. There's no postcard saying, "Hi, I'm Shakespeare, author of works like Hamlet or Othello," and Shakespeare didn't see his complete works through publication (like Ben Jonson did). But he did supervise the publication of Venus and Adonis and Lucrece, each of which has a dedication signed "William Shakespeare." The dedication of Venus and Adonis begins with these words: "I know not how I shall offend in dedicating my unpolished lines to your Lordship." Could that possibly be construed as a claim to the authorship of the lines that follow? Perhaps the multiple other publications that bear his name could also be considered claims of authorship. In trying to figure out a way that this could count as technically true, I hurt my brain. Perhaps no one used the word "met" in describing the ways they encountered, interacted with, saw, talked to, wrote to, received messages from, appeared in court with, took a deposition from, or acted with Shakespeare. 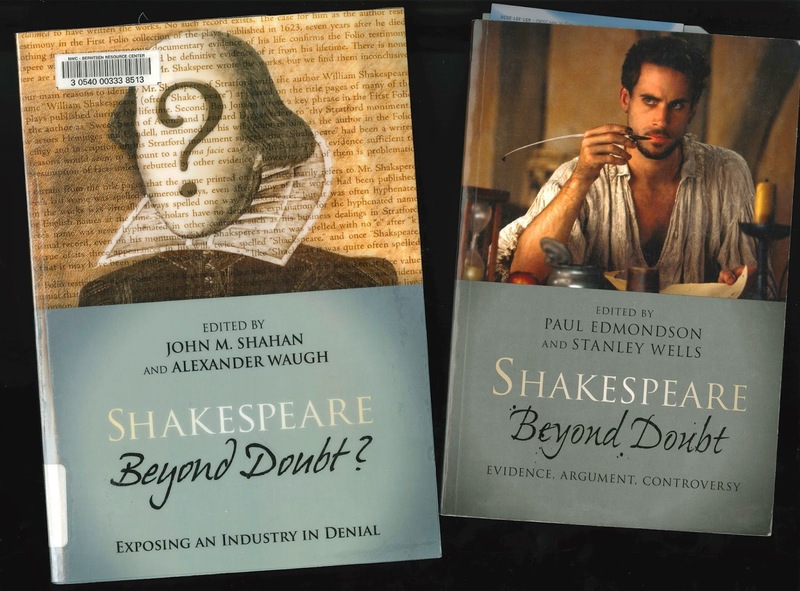 I point to Stanley Wells' "Allusions to Shakespeare to 1642" in Shakespeare Beyond Doubt for a mass of contemporary connections between people and the playwright Shakespeare. The second sentence above could do with some clarification. Who thought it was a pseudonym at the time? Where did they say so? How did they say so? When did they say so? That claim needs substantial support. The parenthetical remark "(after his first two dedications)" undermines good reason number one above. I also fail to understand why direct address to the public is a prerequisite for authorship in the English Renaissance. I also think the Epilogue to 2 Henry IV would count as a public address if such a requirement is necessary. The rest of this good reason is filled with red herrings. With the exception of some actors with star power (Shakespeare was a great author, but he didn't take starring roles—either because he was too busy or because he didn't have the gift of great acting), we know very little about who played what role when. It's not fair to demand that we know something about Shakespeare that we don't know about the majority of actors of the period. This point is both misleading and irrelevant—especially the word "most." There are letters from some other writers of the period—but how does the absence of a surviving letter disprove authorship? And how about a letter to Shakespeare. We have a draft of one of those. By the way, even though I would like to use that as evidence of Shakespeare's authorship of the plays, I recognize that it, too, is irrelevant to the question of authorship. First, there's not a clear, consistent difference between the spellings of these (imaginatively distinct) two groups. Second, frankly, who cares? Spelling, whether of names or of words, was notoriously unfixed in the era, and the spelling of the name is irrelevant to the question of authorship. Really? He had bad handwriting, so he can't have written the plays attributed to him? That's just silly. Indeed, I think it counts in favor of Shakespeare's authorship of Shakespeare. You try writing out thirty-seven or so plays (not to mention a great number of other poems—and not even counting all the drafts for those works) by hand with a goose quill and then sign a document when you are (presumably) ill and (definitely) toward the end of your life. See if your handwriting doesn't suffer a bit! At least there's an admission that a "commoner" could have "acquired the vast knowledge found in the works" in this good reason. I think that's good enough—a commoner could have done so; one named Shakespeare did do so. I don't even need to mention that Ben Jonson, at least as learned as Shakespeare if not more so, had the same level of education that Shakespeare had. Shakespeare Beyond Doubt? goes on and on and on in very much the same vein, producing no new evidence (no evidence at all, really) and no new argument. Since the arguments have all been addressed and debunked, the volume simply indicates that the argument is stagnant. The era of questioning Shakespeare's authorship of Shakespeare's plays has come to an end.